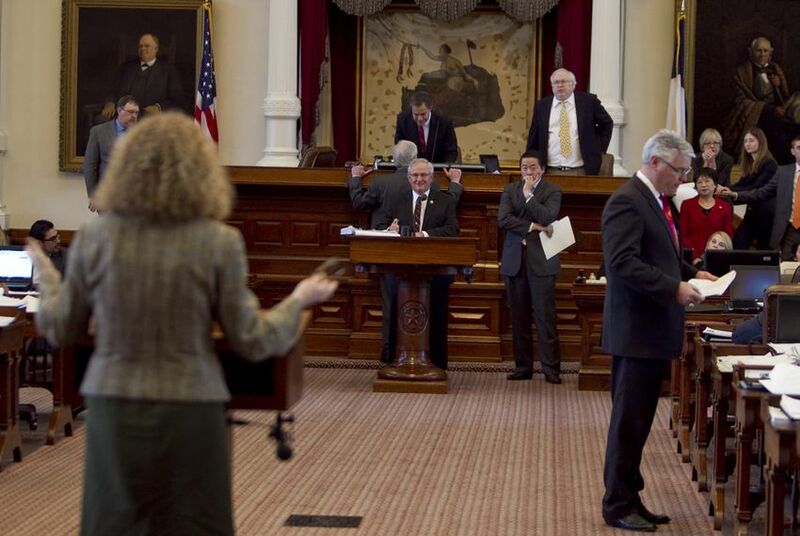 UPDATED: Debate over the balance between rigor and flexibility in high school graduation requirements dominated Tuesday’s discussion over education legislation that eventually legislators in the Texas House tentatively approved. Editor's note: This story has been updated to reflect tentative passage of the legislation and include additional details from the debate. The challenge of finding balance between rigor and flexibility in graduation requirements dominated Tuesday’s debate over legislation that would significantly change the courses students need for a high school diploma. The measure tentatively passed the Texas House. “Every conversation I’ve had for months has revolved and swirled around this issue,” said House Public Education Committee Chairman Jimmie Don Aycock, R-Killeen, whose bill cleared the lower chamber 145 to 2. Though Aycock's House Bill 5 also addresses the state's student assessment and accountability systems, most of the discussion Tuesday focused on its provision that would reduce the number of math and science courses they must pass to graduate and would allow them to complete “endorsements” in areas like technology, science and business. Educators and parents, along with representatives from industry and trade groups, have turned out in droves at committee hearings to support the bill's graduation requirement provision. They argued the proposal would keep more students engaged in their education and help supply the state’s workforce. But the measure has also drawn increasingly vocal opposition amid concerns it could hurt low-income and minority students who lack the parental guidance to navigate multiple options under Aycock's proposal. Critics also view the legislation as a move to lower graduation standards. In response to those criticisms, state Rep. Mark Strama, D-Austin, introduced an amendment that would automatically put students on the path to earning a “distinguished” diploma. The "distinguished" plan would add a year of math and science to the foundation program, unless a student chose to take the endorsement option. To be eligible for automatic admission to Texas universities under the state’s top 10 percent rule, a student would have to complete the “distinguished” plan. Strama said schools should assume that students are capable of completing high-level coursework and allow them to opt out of it — not the other way around. Under Aycock’s legislation, after completing a “foundation” program with four credits in English, three in math, two in science and three in social studies, students could choose to go the endorsement route or complete an additional year of math and science for a “distinguished” diploma. Currently, the “4X4” graduation plan requires four years of courses in math, science, social studies and English for all students unless they opt for a “minimum” plan. Strama's amendment failed with a 97 to 50 vote, but not before lawmakers struck up unconventional alliances across partisan and regional lines as they argued about whether state high school graduation standards should prepare all students to continue on to college or provide more flexibility. Higher Education Chairman Dan Branch, R-Dallas, signed on to Strama's amendment after he said HB 5’s loosened requirements might send the state in the wrong direction in preparing students for the 21st century economy. State Reps. Joe Deshotel, D-Beaumont, and Larry Gonzales, R-Round Rock, sprung to the legislation’s defense — saying that it would make for more engaged parents and students and improve dropout rates and career preparation. State Rep. Sylvester Turner, D-Houston, citing the gains low-income and minority students have made under the current system, rejected Deshotel’s concern. Debate on the bill stretched from about 10 a.m. to 7 p.m. as legislators considered more than 150 pre-filed amendments. Delivering his closing remarks, Aycock praised his colleagues on a "spirited debate that hasn't sideswiped the issues."